What was left out was that the store had already begun making onerous demands of Blumenthal, including requiring him to have an “interlocutor” on stage, specifically, one who would appease the Syrian American Council. Blumenthal secured Andrew Cockburn, one of the premiere journalists covering U.S. and Middle East politics and a longtime correspondent for Harper’s Magazine. But Blumenthal told MintPress that Cockburn was denied; Politics and Prose management insisted that Cockburn was “too sympathetic” to his own views. As the pressure campaign increased, so too did the company’s suspicions of Blumenthal. One would think that they would be familiar with Blumenthal already, as he has appeared for three previous book events there. Critics say that Blumenthal paints a rescue organization as a terrorist group and has mocked victims of war crimes. What they leave out is that Blumenthal’s reporting exposed that rescue organization — the infamous White Helmets — as a Western government-funded public-relations project that has, in fact, been operating alongside extremist groups like Jabhat al-Nusra and Al Qaeda. And he has not mocked victims of war crimes, but instead made light of the lack of evidence of those crimes beyond manipulative social-media videos that ranged from the slickly produced to outright sloppy. The Syrian American Council celebrated the success of their pressure campaign, thanking Politics and Prose for “listening” to the “Syrian American community,” whose views, in their implicit opinion, are monolithic. They went on to accuse Blumenthal of denying the “lived experiences” of Syrian Americans, who in reality are not so homogenous. Thus they were able to silence their most effective critique. Blumenthal’s latest book, The Management of Savagery, reveals the cynical aspirations of this lobby, from regime change to genocide, if its bedfellows are any indication of its aims. None of these people who tried to have me canceled have read this book, but it’s understandable that they would want it banned, because it is actually about them. But if they had opened the book they would see that it’s actually a critique of right-wing politics and Islamophobia through the framework of American empire, showing how these proxy wars and regime change wars that the West has waged from Afghanistan to Iraq to Libya to Syria have been like steroids for the ultra-right, whipping up a xenophobic frenzy thanks to a series of refugee crises that our national security state fomented. Blumenthal has been covering what he calls the “anti-Islam industry” for years. In fact, it is part of what brought the author to prominence. His investigation into the rise of Islamophobia in which Blumenthal named and shamed leading anti-Muslim agitators and funders predated mainstream studies of the trend and was even blamed in an angry screed by the far-right FrontPageMag for providing “the idea behind” the Center for American Progress report on anti-Muslim politics, “Fear Inc.” Blumenthal told MintPress that he founded the Grayzone Project at AlterNet in 2015 in part to provide critical coverage of the dangerous anti-Muslim politics that Trump was exploiting at the time. During his exchanges with the owners of Politics and Prose, Blumenthal said he emphasized the double standards they were applying to him. Blumenthal said that the owners of Politics and Prose insisted they’d spoken to “Middle East experts” about his book and that they expressed reservations about hosting him. But when pressed for the names of those experts, he received one: Amy Hawthorne, a former resident fellow at the Saudi-funded Rafik Hariri Center at the Atlantic Council – a think tank backed by the arms industry and various Gulf monarchies that has been at the center of the campaign for regime change in Syria. Before her time at the Atlantic Council, Hawthorne worked in the US State Department, where she “helped to shape and coordinate US support for Egypt’s transition and advised on the US response to the Arab Spring,” according to her bio. Another one of the self-styled Syria experts who pushed to have Blumenthal’s Politics and Prose event canceled was Charles Lister. Like so many of the lobbyists demanding the censorship of Blumenthal’s book, Lister is a fellow at a Gulf-funded think tank featured in the “Management of Savagery” for research that falsely claimed that 70,000 so-called “moderate rebels” were battling the Syrian government. When Blumenthal personally confronted Lister about his discredited claims during a 2017 Atlantic Council meeting, Lister flew into contortions and struggled to push back. I’ve read @MaxBlumenthal’s book and there’s a section about @Charles_Lister that he would hate for the public to see. So he resorts to getting Max censored. Sad! Mouaz Moustafa, the director of the Syrian Emergency Task Force, also joined the campaign to block Blumenthal’s book event. 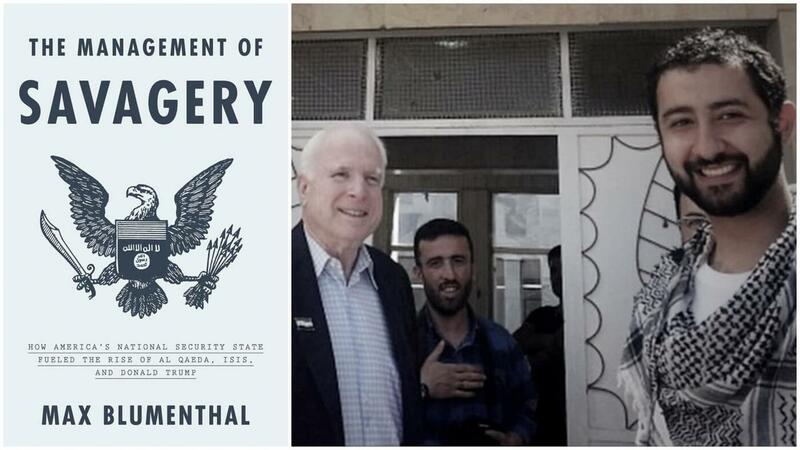 In fact, Blumenthal’s book documents how Moustafa served as the Washington point man for the Syrian regime change operation, escorting John McCain to the Syrian border in 2013, where the late senator posed for photos with extremist insurgents involved in the kidnapping of Shia pilgrims. As Ben Norton reported at The Grayzone, Moustafa has continued to lobby the Trump administration on Syria. He even boasted that he was “hanging out” with CNN anchor Wolf Blitzer and MSNBC’s Chris Matthews at about the same time as he was clamoring online for the cancellation of Blumenthal’s book event. The Syrian American Council, the pro-war lobbying outfit that led the charge against Blumenthal’s book, has also been involved with some unsavory figures during its push for regime change in Syria. As Norton reported, the Council hosted at its 2015 gala a Syrian opposition activist named Maher Sharafeddine who has openly called for the genocide of religious minorities in Syria. “It is the right of the [Sunnis] to demand the slaughter of the Alawites,” the host of that Al Jazeera show, Faisal al-Qassem said, “Of course, of course,” Sharafeddine replied. Perhaps the most remarkable figure to weigh in against Blumenthal’s book and demand the cancellation of his event was James Le Mesurier. A former British military intelligence officer and UAE-backed mercenary, Le Mesurier oversaw the foundation of the White Helmets in Turkey and placed himself at the center of destabilization campaign against Syria’s government. Through the White Helmets, who were at the scene seemingly any time a major chemical attack was alleged, Le Mesurier played a central role in driving the US to bomb Syria over so-called “red line” violations. Blumenthal’s book is available through his publisher at Verso and many other locations. The launch event for ‘The Management of Savagery’ will be held at the Justice Center at 617 Florida Avenue NW, Washington, D.C. on Wednesday the 10th at 7:00 p.m. Eastern Time.